As Gina Haspel, President Donald Trump’s pick to lead the CIA, faces a Senate grilling about her role in the agency’s post-9/11 torture program, nearly 300 pages of newly declassified CIA documents give an unprecedented look at the chaotic early days of the agency’s so-called rendition, detention, and interrogation program — including a time when Haspel helped oversee it. The alleged mastermind of the 9/11 attacks lied and fabricated information to avoid torture, the documents show. Another detainee provided key information before being subjected to the some of the harshest torture techniques, such as waterboarding — and interrogators kept torturing him even after they determined he very likely had no more new threat information to give. The CIA documents released to BuzzFeed News are heavily redacted and do not mention Haspel by name, but they largely cover the years immediately following the Sept. 11 attacks, some of which Haspel spent working at the CIA’s Counterterrorism Center, which oversaw the torture program. 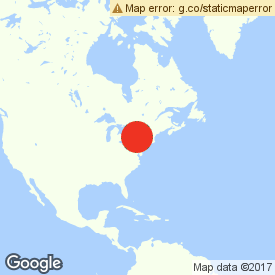 According to the CIA, Haspel was a deputy group chief at the CTC from 2001 to 2003 and was a senior-level supervisor at the CTC from 2003 to 2004. Abu Zubaydah's and al-Nashiri’s torture sessions were videotaped at least a dozen times between April 2002 and December 2002, and Haspel, a veteran counterterrorism officer, was an advocate for destroying those videotapes and drafted the cable authorizing their destruction. 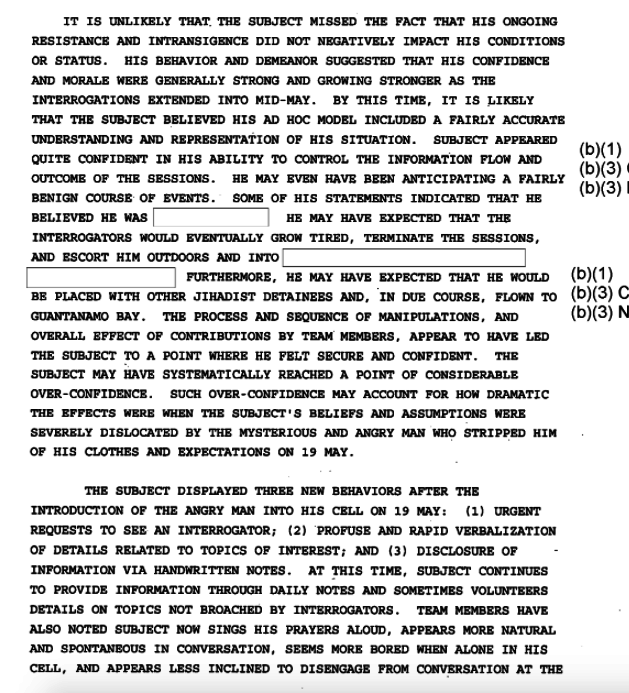 An internal CIA review of the incident cleared her of wrongdoing. The documents, which include cables, detailed narratives about several detainees’ torture, PowerPoint presentations, talking points, and legal analyses, were obtained by BuzzFeed News and Ryan Shapiro, a PhD candidate at MIT and the cofounder of the transparency project Property of the People, in response to a long-running Freedom of Information Act lawsuit. Despite what critics call the selective declassification of information about Haspel’s career, much of it has remained a secret. Several Democratic senators on the Intelligence Committee, which will host Haspel’s confirmation hearing on Wednesday, have urged the CIA to declassify information about Haspel’s role in the “deeply flawed” program, “as well as a number of other disturbing facts about her record.” Like all members of the committee, the three senators — Dianne Feinstein, Ron Wyden, and Martin Heinrich — have access to classified materials, more of which the CIA delivered to Capitol Hill on Monday. With at least one Republican, Kentucky Sen. Rand Paul, opposing her nomination and Arizona Republican Sen. John McCain absent while fighting brain cancer, Haspel will require at least some Democratic support to be confirmed. On Friday, she sought to withdraw her nomination after the White House raised questions about her role in the torture program, the Washington Post reported. The documents obtained by BuzzFeed News are cited as the footnotes to the committee’s publicly released, 500-page executive summary of the report. 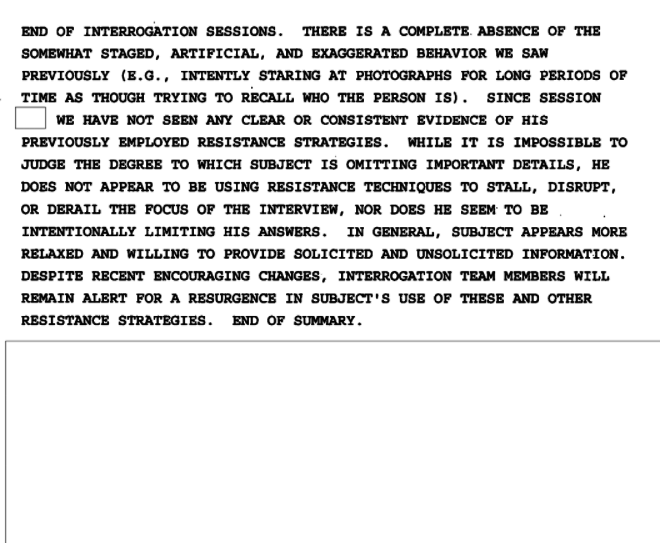 One heavily redacted document — “legal considerations for CIA officers” — reveals that two months after 9/11, the CIA was exploring whether the US government should adopt a policy of torture. “A policy decision must be made with regard to U.S. use of torture in light of our obligations under international law, with consideration given to the circumstances and to international opinion on our current campaign against terrorism-states may be very unwilling to call the U.S. to task for torture when it resulted in saving thousands of lives,” states a bullet point in the document, marked TOP SECRET. Documents from the spring of 2003 reveal that Khalid Sheikh Mohammed — or “Mukhtar,” as he was also known — fabricated information about several threats and individuals while being tortured. 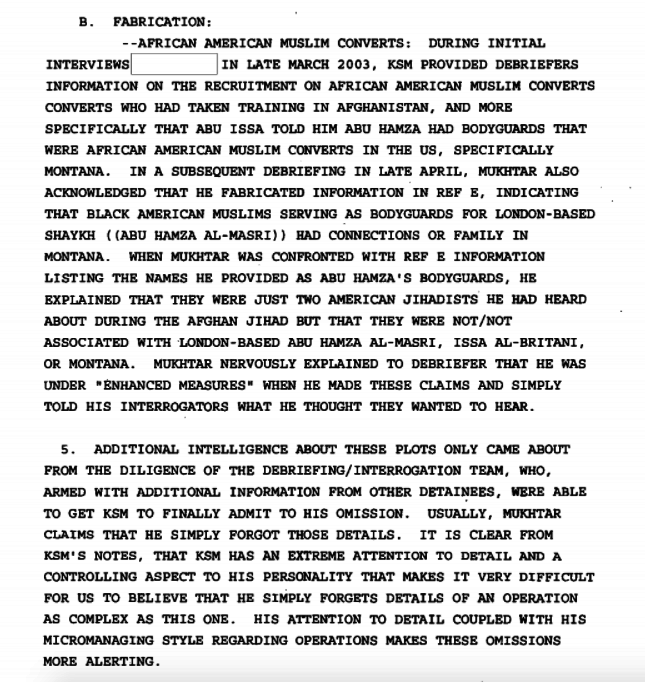 “Mukhtar nervously explained to debriefer that he was under ‘enhanced measures’ when he made these claims and simply told his interrogators what he thought they wanted to hear,” reads a document dated June 2003. Though the documents say he did provide information to interrogators about plots in the United Kingdom, Pakistan, and the US, Khalid Sheikh Mohammed’s omissions and fabrications had created long-standing concerns at CIA headquarters. 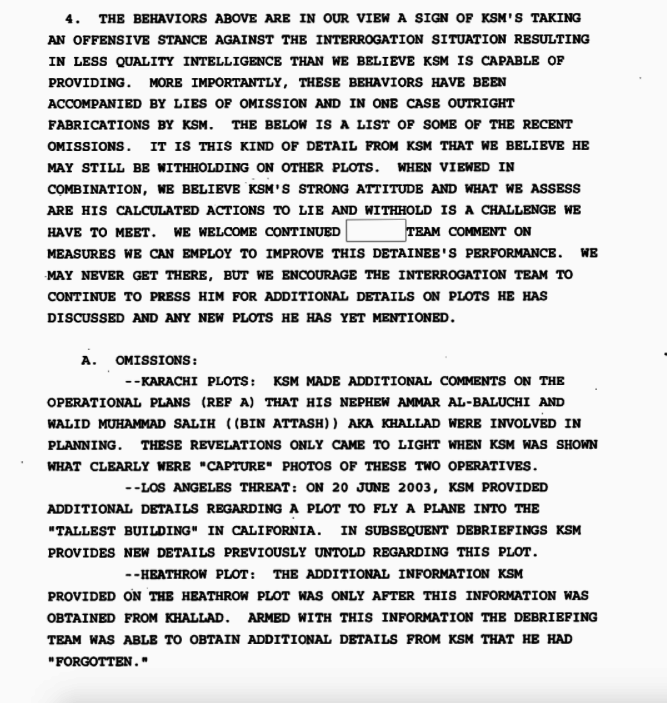 “KSM’s pattern of behavior over the past three months, trying to control his environment, lying and then admitting things only when pressed that others have been caught and have likely admitted the plot, is a cause for concern,” states another June document, which includes a detailed list of the issues with his behavior, ranging from complaints about stolen cheese to disobeying guards. “We think that it is entirely possible that he may never provide information on additional plots, but we believe that we would be remiss if we did not look at the possibility of changing his environment to gain further cooperation,” the cable reads. The CIA and supporters of the torture program have maintained that suspects such as Khalid Sheikh Mohammed and Abu Zubaydah provided key information about terror plots after undergoing the harshest interrogation techniques, in Abu Zubaydah’s case, the documents appear to show that he provided significant information before being waterboarded. Abu Zubaydah still proved resistant, however, prompting the CIA to change their interrogation strategy to an aggressive one that spring. On May 19, 2002, Abu Zubaydah’s “beliefs and assumptions were severely dislocated by the mysterious and angry man who stripped him of his clothes and expectations,” reads a June document assessing the evolution of his cooperation. “In addition to providing the notes, subject began to speak rapidly and deliver an outpouring of information,” the document says. The CIA has so far not offered any insight into whether Haspel believes the torture program was an effective means of gleaning intelligence from detainees and staving off attacks in the aftermath of the Sept. 11. She has, however, privately told senators that she would not restart the program despite the fact that Trump has vowed to bring back waterboarding and other torture methods. You can read the documents here. CIA Nominee Gina Haspel Ran A Black Site. That's About All We Know.